Print advertising is advertising in a medium such as a newspaper, magazine, or trade journal. This encompasses everything from media with a very broad readership base, such as a newspaper or magazine, to more narrowly targeted media such as trade journals. This form of print advertising is the "display ad", which is generally a large ad with design elements, illustrations, or photographs and sales copy. Print advertising may be as small as 4" x 5" and as large as a full page or more, depending on the size of the journal. Print advertising does not include brochures, sheets or cards prepared by the manufacturers for distribution directly to a potential customer or at dealerships, car shows and other events. AMC allowed both Hudson & AMC dealers to sell both Hudsons & Ramblers. It was a signal that Hudson was dead as brand. 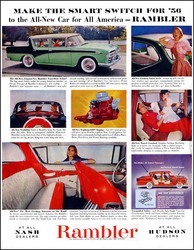 Rambler did sell more cars than 1955, 66,493 to 56,023 but 20,496 were Hudson Ramblers. PLEASE NOTE: Many of our files are available in higher resolution TIFF files or can be converted by our staff to this media. Please contact us at librarian@ahpsoc.org if you need higher resolution images for publication. Some older images were not created at high resolution initially, so high resolution copies may not be available.